Last Sunday was the day after the Music City Brewers Fest and I think we were all moving a bit slower than usual. Loading and unloading cold plates, tap systems, kegs, etc… after a beer fest in the almost 100 degree heat can be brutal. To top all that it’s Sunday…which means a new episode of Breaking Bad. My good friends Ryan and Julie happen to be moving out of state the next day to start a new chapter in their lives. But even in my tired and non beer wanting state I wasn’t going to miss hanging out with them one more time. 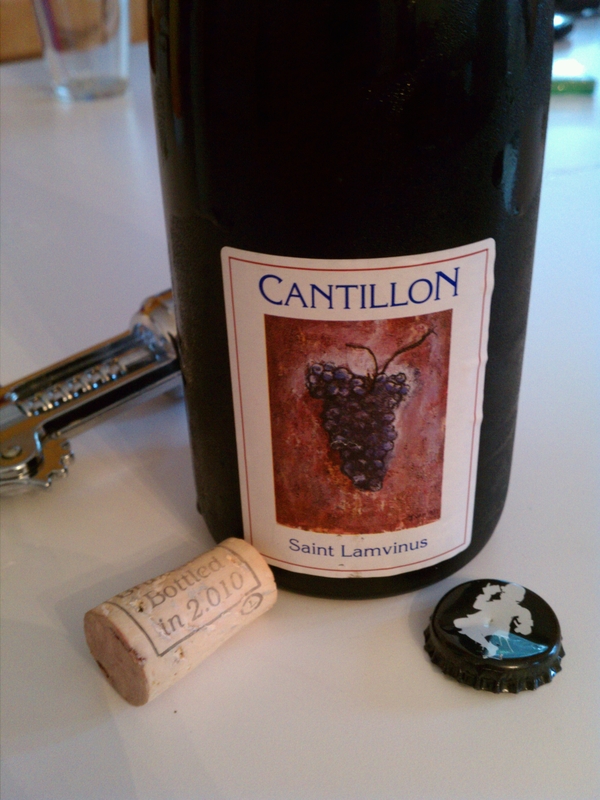 After an hour of chatting and sampling some non sour beers a bottle of Cantillon Saint Lamvinus comes out of hiding. I should have known my friends would have a special sour for us to enjoy together one last time. 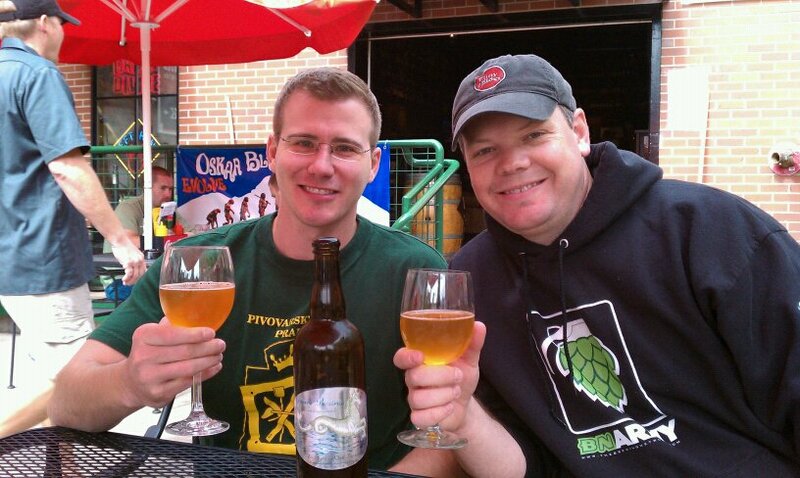 Thinking back… some of my best sour beer tastings and conversations have been with them. These are the same friends I met up with at Falling Rock during GABF that didn’t even blink twice when I suggested we buy a 3 year old bottle of Isabelle Proximus to share during lunch. As I am thinking this I am also foaming at the mouth to get this bottle open, I have never seen this beer, only read some remarks about it, so here is my review. Comment below and let me know what you think about this beer. Appearance– A type of crimson/red/ruby/plum color I have never seen in a beer before. Pink head that was very thin and fell quickly. Tiny bubbles that were soon gone. Aroma- Classic lambic funk blended with red grapes and red wine vinegar. One thing that stood out to me was the aroma of a really good homemade grape jam or preserve. The subtles I picked up were woody, almost freshly bailed hay, and some slight green apple. Taste- From the first sip you know it is Cantillon. 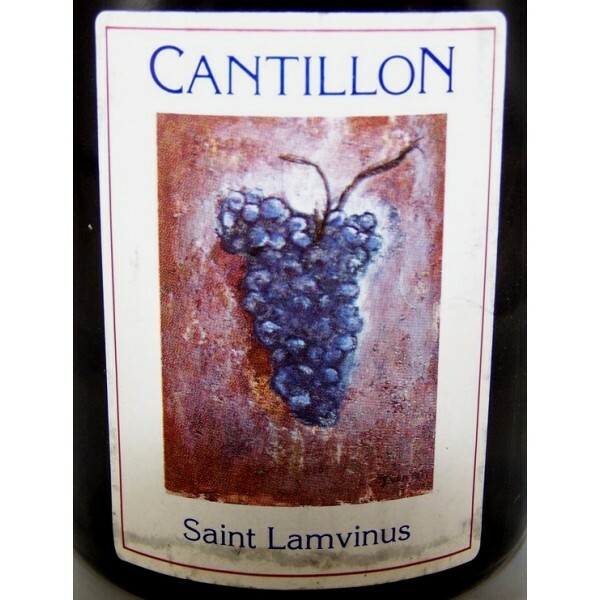 Lactic tart/sourness, Merlot grapes, bitter grape skins, barnyard funk, oaky tannic. The grapes really ride each sip from beginning to end, but the grape flavor changes from a tart wine grape taste to a funky grape. Overall- This is the beer that winemakers worry their precious vino will become if an infection takes hold. It’s a very solid fruit lambic and extremely enjoyable. The body of the beer was spot on, too much more and it would become a bit too much mouth feel. Even though it had all the classic lambic funk, I thought it was on the upper part of mildly acidic. I imagine vintage versions would hold up pretty darn good. Because of this beer the wheels are already turning in my head for a new sour recipe. Maybe some real vineyard grapes with the wild yeast and funk still on them or some vinters juice/puree in the secondary…..hmmm. This was the perfect beer to say the “See you later / good byes” to. It was awesome and different, much like most sour beer fans. A rather moving piece about saying goodbye using beer as a context. Sampling beers like these make it harder and at the same time gives us the strength to move on! I’d also love to try that beer sometime!!! This beer is incredibly good, and is meant to be shared. It would be a tragedy of gluttony to not share with someone else who also appreciated sours, esp if they have never tried it before.